“Philip Slayton studied law at Oxford University as a Rhodes Scholar, and then clerked at the Supreme Court of Canada. He became a law professor and dean of law. Philip then went into legal practice with a major Canadian law firm in Toronto, working on many of the biggest corporate and commercial transactions of the time. He retired from practice in 2000. 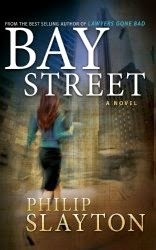 Bay Street was one of those books that left me with a feeling best summarized with one word. Meh. Kind of apathetic or indifferent. I liked Piper, the main character. But she also left me shaking my head on occasion, having a hard time believing a reasonably strong, intelligent woman such as her would do or react the way she did at a few key points. The thriller genre typically demands more from the reader in suspending disbelief and I was never pushed to the point of saying “no way that happened,” but I was right up to the line fairly often. A few examples are her reaction to the continual sexual harassment from the managing partner of the law firm she works at or when she took an unplanned trip to Paris with her boyfriend, knowing it would look suspicious to the police. However, Piper was the high point. The other characters, from minor to major, felt like caricatures, each filling their role in the plot, but with no depth or subtlety. The plot was okay overall, but even there I had a hard time buying into a few key plot twists, specifically one that I can’t say much about without it being a spoiler other than that a high powered lawyer gets his hands dirty in a way that stretched my ability to play along. Possibly approaching this as satirizing the thriller genre would help, although that didn’t work for me. Some adult language and sexual content.